"Sweet Lou From the Soo" Lou Nanne has an autobiography out in 2010. I haven't seen this title yet, so here's more from the publisher, Triumph Books. The name Lou Nanne is synonymous with hockey in the state of Minnesota. As an icon throughout the hockey world, Nanne shares his incredible stories from both on and off the ice in his brand-new autobiography, A Passion to Win. 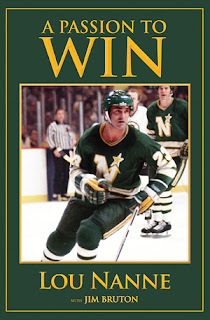 This endearing story of perseverance and determination in A Passion to Win casts new light on the memorable 50 year career Nanne achieved in hockey while both on and off the rink. Nanne takes readers into the locker rooms and onto the ice in some of the greatest NHL arenas in both the U.S. and Canada. Nanne talks about the sensational wins but also the losses that haunt him to this day. Most notably, he speaks frankly about his most harrowing struggle: the disease that nearly overcame him and resulted in his departure from hockey. Nanne also for the first times shares his incredibly combined hockey and business experiences that he utilizes in developing and maintaining a successful career in finance. His strategies, knowledge and lifelong lessons for a prosperous life outside the hockey arena are spelled out in an informative and fascinating manner. Nanne lays it all on the line and reflects on all of his amazing experiences while sharing insights about behind-the-scenes moments in the locker room and the business world. He accomplished his dreams, fought through the hard times and will inspire others to do the same in A Passion to Win. After Lou Nanne captained the Minnesota Golden Gophers and the United States Olympic hockey teams, he had a remarkable tenure as player, coach, general manager, and president of the Minnesota North Stars. Since his retirement from professional hockey, he has championed a successful occupation in the financial industry. He resides in Edina, Minnesota. Jim Bruton, a former prison warden, is the author of The Big House, A Tradition of Purple, Every Day Is Game Day, and Gopher Glory. Bruton was a member of the Minnesota Golden Gophers football team in 1965 and 1966 and signed professional football contracts with the Minnesota Vikings and the Dallas Cowboys.